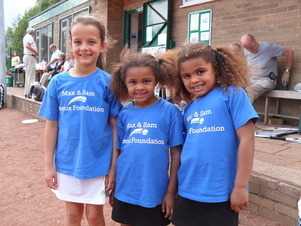 Rainford Tennis Club have held a fundraising day for the Sam Jalloh Sports Foundation and raised £500 to help running sports programmes for underprivileged children in Africa. 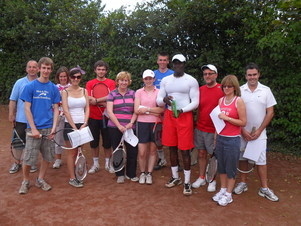 The day, which took place at the Jubilee Recreation Ground, was attended by people from across Merseyside who took part in tennis coaching and competitions, table tennis tournaments and a Cardio Tennis session, delivered by our Head Coach, Samuel Jalloh. There was a Return A Serve Competition, which was won by Conor Porteus and Andrew Corish, whilst Jamie McCafferty won the table tennis tournament. There was also a barbeque and a HEAD Tennis racket demo. “We are delighted that we have had such a successful day and that we have raised the money for the Sam Jalloh Sports Foundation” said the Secretary of Rainford Tennis Club, John Case. The Sam Jalloh Sports Foundation runs coaching and competitions, provide clothing and equipment, improve facilities and support educational opportunities for underprivileged children in Sierra Leone and other nearby countries.